ATLANTA, March 26, 2019 (GLOBE NEWSWIRE) -- Steady, the groundbreaking platform that is connecting workers to the rapidly expanding gig economy and is building a better future for America’s workforce, announced today it has joined World Economic Forum’s (WEF) Centre for the Fourth Industrial Revolution (C4IR), a select group of global companies committed to improving the state of the world. /EIN News/ -- As an independent international organization recognized for bringing together leaders and policymakers in business, politics and academia to discuss immediate economic challenges, WEF strives to demonstrate entrepreneurship in the global public interest while upholding the highest standards of governance. WEF’s C4IR is dedicated to driving positive change through the benefits of science and technology, and has selected nine core technologies it believes will pave the way for the next industrial revolution. Steady recommends personalized income opportunities for users and helps them track their income. In finding financial gaps, Steady assists in connecting workers to employers who can provide them with an increase in monthly income through part-time, one-time and temporary work. Recently, Steady expanded its opportunities to include traditional part-time brick and mortar jobs, as well as user benefits, discounts and an improved income tracking feature that helps mitigate the credit challenges of non-single income, full-time W2 workers. Founded in 2017 by Adam Roseman, Eric Aroetsy and Michael Loeb, Steady is a new platform for workers looking to supplement their income by taking part-time, one-time and temporary jobs. 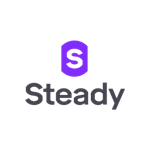 With $9 million in Series A funding, Steady makes it easier than ever for workers to find the best work opportunities available to help build their careers and manage and better understand their income. In September 2017, Steady was chosen as one of 10 startups to participate in Fintech71’s exclusive 10-week accelerator program. One month later it won the Startup Pitch competition at Money 20/20, the world’s largest financial services innovation event. As of March 2019, the Steady app has been downloaded more than 800,000 times. To join the 600,000-strong Steady community, users can maximize their income by downloading the free app from the App Store and Google Play. Employers interested in partnering with Steady can contact Steady at partners@steadyapp.com.